Your business may or may not be on the (subjectively defined) fast track right now, but one thing’s for sure: Every day your kiddos are as little as they’ll ever be. In this episode I examine the shortcomings of the hurry + worry method (of which I am VERY familiar). 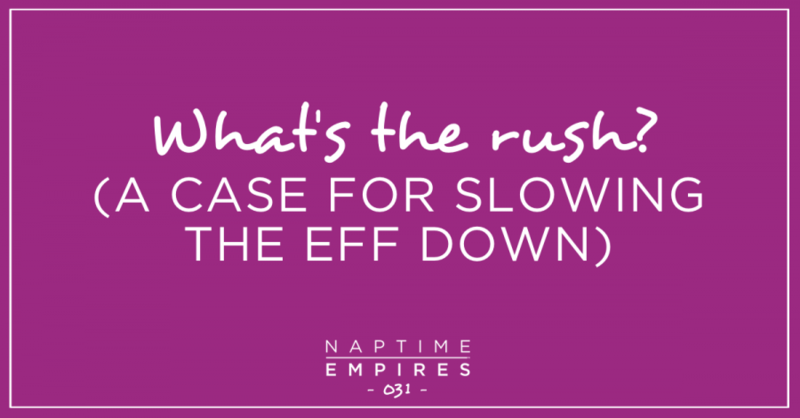 I propose a NEW way of doing #naptimeempires life and business: one where we give ourselves permission to chill out a bit, embrace the season we’re in, and TRUST that as we take the next right step, and the next, and the next, we’re always RIGHT where we need to be. Take a deep breath and join me.